This web site tells the story of the Friendship Doll exchange between Japan and the United States in 1927. More importantly, these Friendship Dolls continue to play an important role in promoting understanding, peace, and friendship between children and adults in the two countries. American and Japanese children still receive Friendship Dolls from their overseas friends. These dolls delight children and give them a better understanding of the culture in another country across the Pacific Ocean. 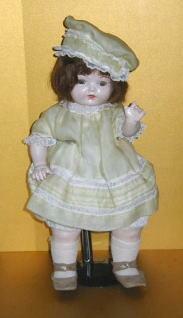 What are the Blue-eyed Dolls? The "Blue-eyed Dolls" refer to the nearly 13,000 dolls given to Japan in 1927 by American children in a program with the slogan "world peace through children." They were originally called "Friendship Dolls" in English, and in Japan this term is also used. 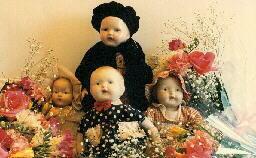 Nowadays the term "Blue-eyed Dolls" is widely used in Japan to refer to these Friendship Dolls. 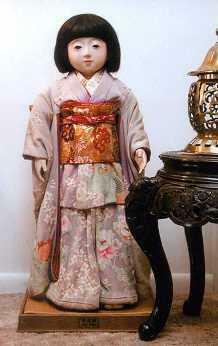 I just saw a feature about the old ladies of Ehime, Japan who had experienced the exchange of these dolls in their youth. Now, in their old age, they paint pictures of girls with dolls on the wooden board used to stick food on (kamaboko ita). When they first met some American girls who presented the dolls to them, they were much afraid of these foreign creatures, but then, looking at the beautiful blond hair and shaking hands with their peers, they felt happy. Most burned the dolls and the photos of that time when WW2 started, but regret it now.
. Ichimatsu Ningyoo 市松人形　Ichimatsu friendship dolls .